Young Artists For Haiti, the Canadian collective of 50+ musicians which covered K’naan’s “Wavin’ Flag” to raise money for the victims of January’s devastating earthquake, remains at No. 1 on the SoundScan Hot Digital Songs chart for the fourth week in a row and has sold 80,000 downloads to date, just under 20,000 of those this past week. Produced by Bob Ezrin, the man behind Pink Floyd’s The Wall, Kiss’s Destroyer and Alice Cooper’s Billion Dollar Babies, during the Vancouver Olympics last month at Bryan Adams’ studio, The Warehouse, the song features such artists as Avril Lavigne, Drake, Sam Roberts, Hedley’s Jacob Hoggard, Sum 41’s Deryck Whibley, Broken Social Scene, Nelly Furtado, Justin Bieber, Kardinal Offishall, Metric, Simple Plan’s Pierre Bouvier, Colin James, Tom Cochrane, Jully Black, and K’naan himself. 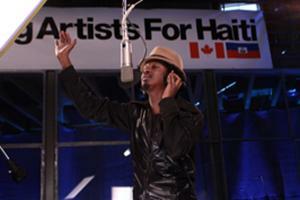 “I got a call from Randy [Lennox, president] at Universal [Music Canada] and Bob Ezrin,” K’naan tells Samaritanmag. “They had this idea that they wanted to do something lasting, that actually educates young people in Canada about Haiti and not let the fatigue of the subject wash over everybody and everybody just forget Haiti. “They thought that my song ‘Wavin’ Flag’ was the right feeling for this issue, this tragedy. I thought about it and really looked at the whole thing, outside of myself, and thought that ‘Wavin’ Flag’ does feel like the right thing for that so we got together 50 artists over a couple of days. Most of them were there the first day. “Bob Ezrin is an incredible producer,” he adds. 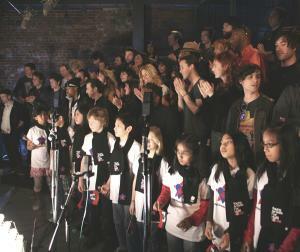 The song sells for $1.29 via www.youngartistsforhaiti.net. Proceeds go to War Child Canada, World Vision Canada and Free The Children.